Heavy Duty Stainless Steel and Composite Sinks, Garburators and On Demand Hot Water Heaters. We are pleased to provide Kindred Sinks and Kitchen Accessories for our customers to complement our countertop offerings. Kindred manufactures a large variety of residential and commercial stainless steel sinks and composite sinks and accessories. Please visit the Kindred Website for complete details. 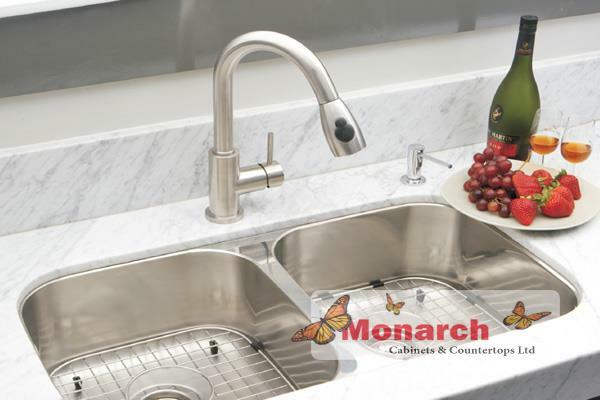 Stainless Steel, Arcylic and Quartz Sinks Top Mount, Undermount or Seamless. We are pleased to also provide Karran Sinks and Kitchen Accessories for our customers to give even more options. Karran manufactures stainless steel, acrylic and quartz sinks in a large variety of styles and design options. Please visit the Karran Website for complete details.